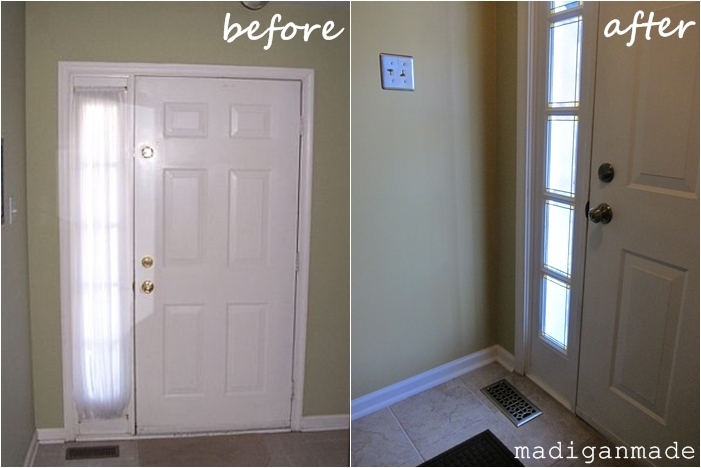 Do you have a little and long window next to your front door? Do you ever struggle with what to use for a window covering? When we moved in, I couldn’t stand the old sheers that hung over our window. I wanted something that allowed light to filter inside. It also had to provide privacy… but still allow me to peek outside and see who was at our front door. And, of course, it had to be simple. My solution: DIY stained glass. See: privacy and I can still peek out! Want to know how create your own stained glass window? 1. Grab some stained glass paint, “lead” strips and liquid “leading” from the craft store. 3. Come up with a design for the windows. I kept ours simple with framed rectangles and boxes. Straight lines are easy to make with the lead strips. 4. Adhere the “lead” strips to the glass in your desired design. I first used 1/2 inch painter’s tape on the glass to guide my straight lines. 5. “Solder” the joints of the lead stickers with the leading liquid. 6. Take your stained glass paint and fill in the desired areas. You can vary the paint techniques to achieve different textures in the ‘glass’. You can just brush it on thick for a smooth look – like the amber corners in mine. Or you can use a sponge and dab it on for a mottled look – like my frosted wavy glass in the center. 7. Allow to dry and enjoy your pretty new window! The beauty of working with these paints is that if you make a mistake, the paint can be scraped off. The paint is not permanent. This is also an advantage when you go to resell your home. Let’s face it, not all buyers may appreciate your personalized design in glass. I did this project about 4 years ago. When we want to sell our house, I can just scrape the design off. But I think I’d be fighting a losing battle to keep that area maintained. Why? Someone’s hot little breath is slowly making a ‘hole’ in our stained glass. Oh well. It’s hard to be upset about the reason, especially when she is so darn cute! Thanks so much for the opportunity to share this project with your readers! I love your windows, and with a pup who has all but destroyed my front door blind, I think I’ll give the stained glass a go – my concern is about the “leading” strips. Everywhere I look, it appears they are real lead – and as the dogs like to sniff and state out the door, I’m concerned about lead poisoning. I live in Louisiana, so it’s incredibly humid – otherwise I would just do it on the outside of the door. Any tips or ideas on products that are lead free? Otherwise, I may wait for the fall and do it on the outside… Thanks for the great, classy idea. The faux glass plastic covers are awful so I was excited to find such an easy DIY alternative! Where can I buy those small curtain rods? Hi Kristin – This was a guest post, so if you’ll head over to the guest’s blog (linked at the top of the post) then you can ask there and hopefully they have an answer for you. Thanks! Oh.. So it can be removed? This is the look I want for my living room windows, as they look right into my neighbors kitchen, but it has to be something that can be removed.